No-one ever showed me how to run-up to the crease and bowl, I just worked out a way of doing it as a kid, so when I returned to cricket much later in life, I just reverted to the way I did it at school. For the last 8 years or so I’ve worked on it a little with some guidance from people on the internet and as a result modified it a bit, but I’ve always been aware that it’s not that good and it's massively inconsistent changing in games and during the season and I’ve never been able to figure out how to go about improving it. This year at the start of the season I bowled fairly successfully off of a slightly longer run-up than usual. This happened after some feedback from a good wicket keeper I played with for a month or so, and as a result I took a decent amount of wickets. I then injured myself and went back to shorter run-ups for the rest of the season while my Achilles tendon healed. Get a mate to watch what you’re doing and mark out the specific finishing points. Find a football pitch or somewhere with straight line on to run along. With a ball in your hand run along the line gathering speed or establishing a rhythm, at this point don’t worry about starting and ending points, just run along the line gathering pace until it feels right to go into the delivery stride. Do this about 10 times or longer if required until it feels right. Now mark a starting point and repeat that run-up watched by your mate/coach. Each time you stop, get him/her to mark your BFC (Back foot contact) point – where you land coming out of the bound. Repeat this, 10 times to establish your most consistent landing point. Measure that length out – that is your run-up, work with it and tweak it so that you don’t over-step the crease. Keep an eye out for the video as it may reappear someday. 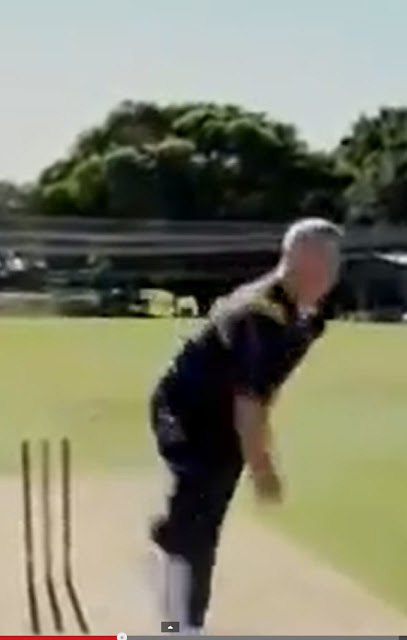 In the meantime despite the fact that this is a seam bowlers run-up - the basic premise relating to setting off on the correct and consistent foot and maintaining a smooth approach is all relevant and worth having a look at, as to is Stuart MacGills video. Cheers Alex, Glad you liked it.